Ireland beat England in the Cricket World Cup today, in probably the biggest shock in the history of any sport, they were 400/1 outsiders to beat England and there were Irish takers!. They not alone beat the English at their own game, the also broke two World records by securing the tournament's highest ever run-chase when Kevin O'Brien clocked up its fastest ever hundred in World Cup history.. He reached his century from just 50 balls, in their World Cup victory over England. O'Brien said afterwards "I'm pretty speechless at the moment. "To be honest it's the best innings I've ever played since I started playing cricket. I just kept going and kept beliving and it went our way." In the last cricket World Cup minnows Ireland shocked the World Champions by also beating Pakistan and putting them out of the competition as result Pakistan's English manager kicked the bucket immediately after the game, with suggestions he was murdered. Todays win came despite the fact that England since the last World Cup stole Ireland's best player Morgan who was playing for England. Irish people are over the moon about it and now believe if the y can beat the English at their own game , they can beat them at anything, including getting their occupying army out of Ireland once and for all ! There 's talk on Facebook of the Irish turning their bats into shillelaghs at some wild parties of celebrations tonight as in the video below ! Meanwhile on Sky, Bob Willis says Kevin O'Brien will "probably be made a saint shortly." Matthew Hayden's century in St Kitts against South Africa four years ago (previously the best World Cup ton) came off 66 balls, O'Brien made Hayden look like Boycott - his came off 50! What a player, and that's the last comment from me, so goodnight and rest easy. If you have any energy left, please read Sam Sheringham's match bulletin. Oh and remember the BBC TV highlights are at 2200 GMT on BBC2, red button and on this website. "There will be people turning on the radio, and there will be people rubbing their eyes in disbelief. To see any team come and win from that position is pretty something, but when you are the underdogs it's pretty special." Just a quick reminder if you didn't spot my comment earlier, Ireland were backed at 400-1 halfway through this chase on some betting exchanges. "I am virtually in tears, I can hardly speak. I just never thought this would happen. This has been the most incredible day in Irish cricket history. The fashion of the victory, the way we went about it, the team spirit..the calmness and assurance at the end. It is just truly remarkable. We just did it in such a calm fashion." Kevin O'Brien: "Knocking off the greatest run chase in World Cups - it's pretty much the greatest day in our lives. We believed in ourselves even after losing the other night when we should have knocked off 200 against Bangladesh." Andrew Strauss: "Things were looking pretty comfortable but we weren't reckoning on an outstanding innings from Kevin O'Brien - it was pretty brutal and set us back. Our World Cup dream's not over by any means, we are going to have to bounce back and learn from this but we have haemorrhaged runs in all our games so far. We put down three or four catches today and in the end that's cost us the game." From aaronwhite910: "Fair play to Ireland. That was one hell of a chase. With possibly the best ODI innings ever." Well the nuts and bolts are that that was the highest successful chase at a World Cup, and it included the fastest World Cup century. As well as some very happy Irish fans, I suspect there are one or two bruised Australians with some tough Ashes memories who enjoyed Kevin O'Brien and his mates' assault. From bossbeechyscoop: "The blame starts at the top: Strauss one-day captaincy is clueless: please retire from ODIs at end of the World Cup." Nicholas Green, TMS inbox: "Does this mean Ireland will be now commandeering England's best players for their all conquering side?" Alex Cusack: "I was just trying to knock it around for Kev, because he's got the power. I think we'll have a few quiet beers tonight." Kevin O'Brien will be chatting later when he collects the man-of-the-match award. That really was an extraordinary result, Mooney completing the victory with a four off the first ball of the last over, bowled by Anderson. Let's remember they werew 111-5 needing 328 to win with barely 25 overs to go. How on earth did they do it? 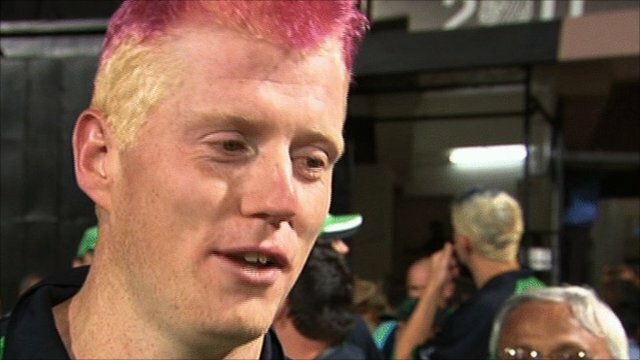 Kevin O'Brien, pink/purple hair and all, was the principal hero with 113 from 63 balls, and believe it or not he actually slowed down towards the end. But never foreget the efforts of Alex Cusack (47) and John Mooney (33 not out). So it's Trent Johnston to join Mooney with 11 wanted from 11 balls, and he's almost won it with his first shot. Broad's attempted yorker was a low full-toss and it skidded away for four. Seven to win from 10 balls. Great, great running from Ireland as Johnston pops one down to long-on, the fielder (Tredwell) did not send back a very good return really, and they get two. Now Johnston, the cool, cool Johnston who hit the winning runs against Pakistan four years ago, takes a single, and Mooney who has played an admirable role moves to 29 with another single. It's three to win from six balls, very hard to see England avoiding defeat now. They went for a silly second run, and there was a great return by Bresnan to Prior, O'Brien's brilliant innings comes to an end. G Boycott: "If you leprechauns can't get over the line now, I don't know... My mum could win it from here; you've done the hard work." Anderson is bowling as Ireland prepare to finish off this remarkable, brilliant chase. O'Brien is pretty tired as he jogs a single to deepish mid-off. Huge lobbed mis-hit from Mooney, but there's no-one fielding at mid-on and it's another Irish single. Oh, good solid clubbing shot from Mooney for four, that could be the death knell for England. Ireland need 12 to win from 12 balls. Broad went down with some bad-looking knee injury just now. Wheels and carts... things dropping off all over the shop. Now it's Bresnan bowling his last over and he starts with a couple of dots at Mooney, before the batsman backs away and smashes one through point for his third boundary. Bopara looks on from behind the boundary edge. Expressionless, but a pound or two for his thoughts right now. Another overthrow tossed away by England as Bresnan kicks the ball past the stumps. Ireland need 20 from 18 balls. From Jonathan Johnston, TMS inbox: "As an Irishman this is very exciting, and if we can beat England it will firmly put us on the map as a cricketing nation. However I am a bit nervous as Ireland can self destruct sometimes in these situations." It's 34 needed from 29 balls after the first ball of Broad's eighth over is hit for a single by O'Brien down to mid-off. After two more singles, there's a dot and the tension just keeps on building up. Mooney's turn to crash a drive for four. It's a horrible, gently floated ball outside off stump from Broad. Where are the brilliant yorkers? The slower ball bouncers that England produced in the Caribbean when they won the World Twenty20? England are bowling utter tripe, but Ireland have poured pressure on them and will thoroughly deserve this victory. Brilliant take by Prior off Mooney's shoulder as Bresnan, in his ninth over, surprises the left-hander with pace and bounce. Then after four dot balls Mooney edges another boundary as he did with the last ball of the previous over. If he'd missed either Ireland would be a bit behind the rate, as it is they are still cruising. This is going to the wire though, I fancy. Broad has managed to keep England afloat in his final spell. O'Brien takes a single, and it's a dot at Mooney before a single from the third ball. O'Brien charges back for a second run from a carefully-played pull, that's well played by Ireland. Defensive push for a single now. It's so interesting how he's gone from biffer to nurdler. Mooney smacks Broad for four with a thin outside edge to a drive. Nine from the over. Ireland remain firmly on course. From drucej31: "Great knock from O'Brien against one of the worst England bowling and fielding displays in living history." Bresnan at Mooney. Dot ball. Bell swoops from cover, it's another dot. Quick leg-bye now, O'Brien and Bell tangling and there was only going to be one winner there. O'Brien is quite an imposing presence, never more so than today. Single for O'Brien, has he decided to stop the big hits for now? Now - run-out chance is missed by Bell and there's an overthrow, I'm sorry to report. Easy single for O'Brien, so can England heap some pressure on the new man, who is John Mooney? Let's see. First ball at the left-hander is a dot. And then he takes the strike with a single off the last ball. Ireland need 53 from 48 balls. Huge misunderstanding between the batsmen, and Collingwood threw intelligently to the bowler's end, where Broad dived at the stumps. Cusack was out by an inch. Broad has to pull this out of the bag for England, well somebody has to otherwise it's game over. Broad's bowling to Cusack, who almost drags a drive onto his stumps, fine stop by Prior but they scamper a single. "Where are the yorkers that England normally bowl?" asks Simon Hughes on TMS. Could there be a run-out? Strauss hasn't a clue who his best bet with the ball is now. As it happens it's Yardy who bowls and Cusack, who has now found his range, hammers a shot back past the bowler for four. O'Brien defends. That's very interesting... And now he turns a low full toss for the two runs he needs for his century, off exactly 50 balls. Ireland need just 56 to win from 54 balls. They are favourites to win now, odds-on favourites having been 400-1 at one point! Oh welcome to the Irish party, Alex Cusack! A huge six off Collingwood's first ball, Ireland barely need a run a ball now. They should win this fairly comfortably, it's like Sunday's match all over again. O'Brien hammers Collingwood down the ground for four to go to 97 from 47 balls. He's about to register the fastest World Cup century by some distance, and he's got pink hair! Yardy starts the 39th over with a leg-side wide. Have England spurned their last chance to end Ireland's fairytale? Cusack drives to long-off for one. Another error from Prior brings Ireland a bye. Everyone's getting a bit nervous because Ireland have started to drop a gear or two, and now Yardy's put down Cusack off his own bowling! This World Cup goes from bad to worse for England. Kevin O'Brien is 10 runs away from probably the finest World Cup century ever. Very shrewd, they're pushing the singles now, because they don't need many boundaries. Very shrewd indeed. Cusack's played a brilliant foil for O'Brien in what will be the most impressive performance by an Irish cricket team ever if they can pull this. Strauss has spilt O'Brien on 91, towering, towering shot but England needed that so badly. From Anon: "I will join in the negativity. Scraped past Holland, struggling against Ireland. It's like an England football team World Cup performance." Bresnan falls over after delivering a ball at Cusack, who gets the single that Ireland need to bring the remarkable Kevin O'Brien back on strike. The required rate is barely seven, Ireland can afford to take it easy and still win. Remarkable stuff this, you know. England appeal for lbw against Cusack but decide not to review the decision. O'Brien smashes a pull shot for four, Yardy can't get there. And he follows up with a huge six as the Indian fans begin to scream in pleasure. They are loving this innings. "The bowlers are on edge. Everyone's trying to put their tuppence in now." "I'm going to have a word with the producers to let me stay on and see this through. This is turning into one of the greatest innings in World Cup history." From Thomas Atkinson, TMS inbox: "Great stuff from Ireland, chance now for the England bowlers to stand up like the batters had to do against Holland and India…"
Three precious dot balls from Yardy at Cusack before the fourth ball goes for two, and the fifth for one. Last ball of the powerplay, crashed by O'Brien through wide mid-off for four more - he's on 80 from 39 balls, and 30 from his last nine balls. Anderson to Cusack, England desperately needing to exert a modicum of control. The required rate has been plunging from way above eight to almost 7.5, which is do-able. Thin inside edge off a huge heave from O'Brien brings him four more. Oh that is a fine, fine shot. Drilled through the covers for four more. He is onto 70 from 36 balls! Now here is a very mighty six into the stands as 17 runs come off Anderson's over. Ireland are down to 13-2 to win this from 400-1 at one point!!! And that six travelled 102 metres apparently, the biggest of the tournament. Gee whizz! Anyone getting a bit nervous thinking Ireland could pull off the unthinkable? I think England will win, but not by much. Anyone want to share in the negativity stakes now, or perhaps just applaud O'Brien's brilliant innings? from Chris Bryson, TMS inbox: "If only Ireland batted like this last week against Bangledesh, we could be chasing down a second win from two!" Ireland need 136 to win from 17 overs and have already made England's final powerplay batting look thoroughly feeble. Cusack does the right thing, again ensuring O'Brien takes most of the strike. Bresnan is bowling, and O'Brien top-edges a pull over the slips for four. You can't begrudge him the odd slice of luck. This is the fastest ODI fifty by an Irish player by the way. Now he slams Bresnan over point for six. Alarm bells continue to ring very loud for England and their supporters now. Marvellous stuff from O'Brien and Ireland. Anderson and Strauss spend an age to set the field. The good news is that Jimmy is proving pretty effective right now, lovely dive from Strauss cutting off an O'Brien drive. Then O'Brien reaches his fifty off just 30 balls with a lovely hook for six! This is alarming for England. From Suggs: "England are doing well with the bat, but bowling looks ordinary and fielding is well below recent high standards. Unlike SA and Aus they have a class spinner. Trouble is they do not have reliable death bowlers for flat tracks." Broad has been hit out of the attack, it seems. So Yardy returns with his left-arm "darts". It's the batting powerplay so Ireland will surely have a real "dart" themselves in these next five overs. Another dreadful error from Prior, four byes here and Strauss shakes his head. O'Brien pulls Yardy twice for four, great over for Ireland! Hideous bowling from Yardy. From Mark Ooj, TMS inbox: "If you take the point that you should double what you've scored at 30 overs . That makes it a narrow win for Ireland." I hope Strauss reads the riot act to his team after this shambles of a performance. Anderson is back on at this end (Broad's first five overs have cost 44 runs by the way!) and he sends down three dot balls before Cusack gets key man O'Brien back on strike with a single. That's the 50-run stand off 31 balls as Cusack gets a lucky edge through the slips for four. Now a much better shot travels through the covers like, well "a tracer bullet" if you're Ravi Shastri. It's 162 needed from the last 20 overs. Could they do it? From iamjoshknight: "It's not so bad getting 2 or 3 fielding errors against Ireland. But 2 or 3 against SA would be suicide." This is turning into a very handy innings for Ireland from Kevin O'Brien, who moves to 33 as he waits in the crease this time and uses the wrists to glance Swann for four. Great shot. Swann finishes with 3-47 which is a fine effort from him, but he tailed off a bit in the last two overs. From Adam Ant: "Agree with Matthew Bowles. Far too negative with your comments. England's achievements in the last couple of years deserve better coverage." So shall I jack in this commentary and just opine about the Ashes for the next hour or two? From Jack, counting his chickens in the TMS inbox: "A relievingly light hearted match after the tense India match to take my thoughts off ICT coursework." Broad, following an expensive opening spell, should enjoy himself more now he's back into the attack. He was excellent in the warm-up games before getting ill. A modicum of inswing for the Notts seamer. Great stop from Trott on the third-man fence keeps Cusack to two rather than the four he was looking for. O'Brien digs out a yorker, then a grim delivery down the leg-side goes for five wides but Prior, who's having a bad game, should have stopped that. O'Brien cuts for four to go to 29 from 16 balls. Required rate coming back down to eight an over. Strauss looks furious. Swann's figures receive a slight dent as O'Brien moves to 19 with a slog-sweep for six. And there's another six from O'Brien, again mowed over deep midwicket. If he stays in for another half hour or so that 100-plus run that Matthew Bowles is after might not be coming. From Matthew Bowles: "You are a tediously negative. Barring a 2/3 of fielding slips, this has been very professional so far. 100+ run win coming." A nice shot from O'Brien, thumping Yardy over short midwicket's head for four. And there's another, slammed through the covers. Wrong length, too full and too wide and got the treatment. Easy two for Cusack out to deep extra cover. He should be an actor with that surname. Swann beats his attempted cut, however, and it's hard to see how the Irish well get close now, but they have not been a pushover - they rarely are. Nelson strikes for the second time in the match as Ireland also lose a wicket on 111. That ball from Swann was going nowhere except middle pole. England aren't keen for this game to go the distance, as Swann has a slip in for Wilson. Big appeal for lbw, given out by Bowden and looks a good shout, but Ireland review. Lovely time for Yardy to come back into the attack after his first over went for eight, which incidentally is exactly what Ireland need per over. Wilson's struggling to pick the gaps, but does get O'Brien on strike with a single to short fine-leg. Kevin O'Brien, a good old-fashioned biffer, edges a drive for four. Top marks for positive intent, and he's wearing a cap rather than a helmet which is good to see. Another wicket for Swann as Joyce comes a long way down the wicket, misses a flighted delivery and Prior completes a very straightforward stumping. Joyce must play the Sachin/Strauss innings of Sunday now if Ireland are to pull off a miracle. He calmly puts Wilson back on strike by taking a single off Collingwood's first ball. An energetic Bell swoops in to keep Wilson on zero, but the number five is up and running eventually with a single down to third man. Tidy finish to the Swann over, with one arm ball beating new man Wilson's outside edge before the next one does the other thing, spinning sharpy into the right-hander's pads. Required rate has zoomed to 7.75. From Stuart, Milton Keynes: "Re the idea of a 'thumping win' for England. I don't care if we win by one run. It will be better for the team's progress to win in tight finishes than by getting a false impression by winning by 300 runs." O'Brien's bright little innings comes to an end as his attempted slog-sweep is missed and Swann celebrates a wicket, an important one. "We've got the off-cutters and off-breaks as England try to build pressure and create another chance. They created a couple of chances of course that should have been taken." Very good running from the first ball of this over gets O'Brien a couple off Collingwood. And now there's two more with a dabbed sweep. Pressure is off Ireland again as the 100 comes up, and it's another decent over for the underdogs. From Paul Smyth, TMS inbox: "Realistically if we couldn’t beat Bangladesh then England are a pipe dream. But no harm in dreaming." An undercurrent from you lot e-mailing and tweeting away is that England are lacking a ruthlessness and I whole-heartedly agree with you. They must at the very least put some serious pressure on these two now, who have each been given a life. Swann's doing his bit, with five overs for 18 to date. It's time for Collingwood's cutters and wobbly things. O'Brien's doing very nicely for Ireland, but Joyce needs to step up his scoring a little to help out his mate. Failed "Dilscoop" attempt from O'Brien, and a good tidy start from Collingwood. From Sreejay, Chennai: "I don’t see why Boycs should think it’s ’pathetic’ that Indian authorities complained! Dave Richardson came out and practically called Dhoni a fool for not getting a rule nobody understands. Geoff B is becoming more like India’s Sidhu on the mic." O'Brien is on the charge again, but has to be content with a single off Swann. Slightly better from England, but it's unlikely they're going to record the big thumping win they were after. From former England captain Michael Vaughan: "I am afraid England players have spent too much time at my fielding academy." Hayden Ballard, who has just e-mailed in, suggests Bopara in for Anderson. Well I don't know about Ravi "bowiling his full 10" but he's a much better bowler than England seem ro realise. Strauss appears to rate the rank rubbish of Pietersen above Bopara's brisk medium pace, which is very bizarre. Meanwhile, O'Brien plays a muscular drive over midwicket's head for four off Bresnan. Rubbish down the leg-side from Bresnan, helped down to the rope for four. Great over for Ireland. This is the last over of the bowling powerplay, and Swann gets through O'Brien's attempted sweep. Now the batsman cuts, but straight to point. There's a single down to long-off at last before Joyce gets a single to short fine-leg. And Joyce hits a six off the last ball of the over which is dropped by Anderson at long-off. A slightly more purpseful jump would have ensured a catch. England are fast becoming the weakest fielding side in this tournament. From Hayden Ballard, TMS inbox: "Bopara in for Jimmy anyone? Fast bowlers are not doing it on these Indian tracks, Ravi can bowl his 10...and then we’d have a finisher...rather than having to keep watching Bresser, Yardy and co. attempt to get it off the square?" Bresnan's bouncer is too hot for O'Brien. One cannot stress enough how important Bresnan and Swann are for England - and they are doing a fine job in tandem right now. The required rate is in excess of seven an over now and England will be happy enough, though Ireland cannot panic yet. The brakes have come on hard since Stirling's departure, and Joyce does not look like the man who scored an ODI century in Sydney four years ago. A thick inside edge almost rattles his stumps as Swann continues to bowl nicely. Alan Lewis on TMS says it's frustrating that Stirling often gets starts before playing a silly shot. His wicket this time was a case in point as Ireland had already scored plenty of runs from the over when he went for one shot too many. Ah, there's a very bad dropped catch from Matt Prior from a top-edged pull by Joyce. Unbelievably, Anderson had also dropped a much tougher chance from the previous delivery. Tough luck Bresnan. From Karim Govani, TMS inbox: "Great to see Ireland give this chase a go! No one gave England a prayer chasing 338 the other day. I don’t think Ireland will win but they will get to around 300." The Yardy experiment comes to an end as Swann replaces Yardy, Strauss opting to take the bowling powerplay. O'Brien gets off the mark with a single and that's a very good start from the England off-spinner who will enjoy bowling at two left-handers. Niall O'Brien is at the crease now. He and Joyce are two good batsmen and they need to produce a big partnership. Dot ball to end the over. Short and wide from Bresnan, that's not like him, and a terrible place to bowl at Joyce who latches onto a square-cut for four. England need a wicket. Now the slower ball is misdirected, and Stirling glances it fine past the man in close for four more. Easy boundary, but now he's out - the pull goes wrong and he's easily caught by Pietersen. Strauss pulls a little rabbit out of the bag, Yardy to bowl inside the first powerplay. Interesting exchange on TMS as Aggers reveals India are lodging an official complaint to the ICC about Bell's not-out verdict the other day. "Pathetic," says Boycott, with no little disdain. Four singles are followed by a Stirling block, before the opener thumps one through the covers for four. From alihalljones: "Stirling will be playing for England in 2015 World Cup then back playing for Ireland in 2019." England turn to one of their heroes from Sunday, Timothy Bresnan of Yorkshire. Quick single from Stirling, then Joyce plays and misses with a flirtatious little waft before Collingwood charges in from backward point to ensure the next one is also a dot ball. Classic Joyce. A shot high on the finesse tarrif, late cut off Anderson for four. Ireland are not too far behind the required rate. Anderson is warned for running down the wicket after delivering the ball. Four leg-byes come via another poorly directed delivery. Not sure what happened to the best bowler in the last Ashes series, but he wasn't peppering the areas outside leg-stumps out in Australia. From Alan in London: "Stirling won't last beyond the first over or two of spin." When people make predictions like that, they are either scarily accurate or hopelessly wrong. Broad has made the wise decision to stop bouncing Stirling. Instead he goes the other way, bowling as full as possible. Then he gets one wrong, slightly short and well wide of off-stump, which Stirling slams over mid-on for four. Lovely, lovely hit. It's England v Stirling out there. Joyce misses out as Anderson slips one down the leg-side, while Stirling also scampers a leg-bye. Joyce drives for his first boundary - too full from Anderson and put away accordingly with some style through the covers. Much better from the bowler, just misses the top of off-stump with one that completely did Joyce. 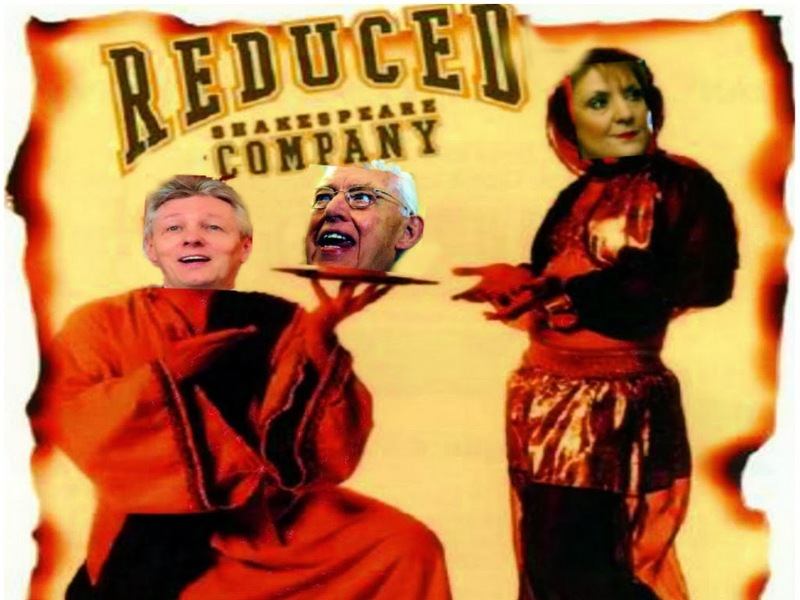 From Luke in Belfast: "Have a deal with Paul Stirling that every six he hits I owe him a Chicken goujon meal, tasty incentive!" Stirling, who was also the best of Ireland's bowlers in my opinion (even though he only took one wicket to John Mooney's four) takes four runs off Broad with a thickish inside edge through the on-side field. Broad comes back with some accurate stuff, then he tries a short one but Stirling pulls him with great comfort for four more. From BBC Sport's Alison Mitchell at the World Cup: "Lot of excitement about Paul Stirling - after the same no of games for Ireland, he's scored more runs and at a faster rate than Eoin Morgan had." Anderson is working up a decent little rhythm against Sussex's Ed Joyce, first maiden of the match. Joyce slices one down to third man off Broad, Stirling pushes to mid-off, and now he pulls Broad for six! Lovely shot, got that away from the fielder so it was always safe. If you fancy backing the outsider in a two-horse race, Ireland are currently trading at 100-1 to win this match. Aleem Dar was bang on with his decision, Broad's delivery at the left-handed Joyce pitched outside the leg stump. Here is Broad, 5kg lighter following that sushi argument, appealing vociferously for lbw, they are going for the review. Joyce plays and misses at a ball angled across him, might have nibbled away a bit. First runs, Broad (he of the dicky tummy) moves across from mid-off to keep Joyce to a single. "Eating sushi such a long way away from the sea!" says Boycott in reprimanding style. Geoffrey is known for bringing his own food into the grounds. A wide from Anderson gets the Irish another run, and Stirling leaves an outswinger well alone. From Edward Lewis, TMS inbox: "Great to hear Alan Lewis on today. I am ancient enough to have, when I used to be scorer for Trinity College Dublin in the early 60s, seen his father Ian play often. We were always glad to se him out! A fine player, I also remember him scoring 41, all off Alf Valentine for Ireland against Windies in Dublin in 1963." Wide half-volley outside off-stump. Rubbish ball, but Porterfield unluckily drags it onto the stumps. England batsman Ian Bell: "At start of the game we wanted to get some good runs on the board and it was nice to do that again today. Jonathan Trott and I know each other inside out so it was good to put on another partnership. We need to come out and do the basics really well and pick up another two points tonight." James Anderson needs to bowl well. Here he is, William Porterfield on strike, Paul Stirling his partner. Floodlights are on. Game on! We will resume at 1315 GMT by our estimation. Rahul Dravid is in the TMS studio during the break, I'm off for a break. Swann, timing the ball much more surely than Bresnan, pings Mooney down the ground for four. Bresnan is caught in the deep off the last ball. Four wickets for Mooney. Well done Ireland, some really accurate stuff over the closing few overs. England were straining like leashed dogs for more runs over the closing dozen overs, but couldn't do it and lost wickets in the process. They should have plenty, I'd be surprised if this Ireland side can make them sweat, but go on, prove me wrong! Swann and Bresnan can only pick up a single off the last three balls. This is all rather feeble. Another England batsman backs away, and hacks at nothing. How do we get Bopara back in this side? He needs to play, surely, especially with no Morgan to call on, though I accept it's difficult to pick the person to make way. Wilson dives forward to swallow up a catch off the bat of Yardy, only he misses it, bad drop that, bad luck Johnston. Chris Phillips, TMS inbox: "RE Nick Fleet, did you not see the England vs India match? Yes, England haven’t been as explosive today as we might have liked, but it takes a brave person to suggest England are lacking in the batting department having chased down a mammoth 338, in a World Cup match, in India, against India." Not sure I'd have sent out Yardy with three overs to go. Broad or Swann for me. Any road, Yardy dabs a single off Rankin, Bresnan connects with fresh air, gets a single and Yardy clean misses a couple. Ugly stuff. Just THREE RUNS OFF THE OVER! Mooney bellows in frustration as a couple of misfields give Collingwood extra runs, and so the Durham man is back on strike to thump the medium-pacer for a towering six over long-on. That was the second biggest six of the tournament, though I don't know how you measure them - presumably predictive ball-tracking devices are used. Mooney misses a chance to run out Collingwood, his kick goes wide. Attempting another six, Collingwood is caught at long-on. Redemption for Mooney. From Nick Fleet, TMS inbox: "Is anyone else not concerned that England only have four in form batsmen. Without Bopara, Morgan or Wright, we have no strength in the middle order. We'll be alright this game, but come South Africa..."
Despite the decent-looking total, this has been a peculiar innings from England. They haven't really accelerated at any point. Ireland have done well to prevent a really big score. And now Johnston bowls Prior, backing away, horrible hack, missed. Prior hits his second ball for four. Full toss, smashed with little fuss through midwicket. Mooney is furious. From BBC Sport's David Ornstein: "Eng-Ire at #cwc orgruelling gym session in Finchley? The latter for Finn & Morgan!" "England have been clinical and professional but they haven’t set the pulse racing. On this surface, on this ground, a score of about 320 is probably about par. England are not absolutely impregnable." Big, lusty swing. He misses and back goes off-stump. Crikey, Trott will be frustrated to miss his century. Funny isn't it? Back go the fielders and Trott immediately deflects Rankin through the slip cordon with total control for an easy four. Collingwood gets a couple of singles, and England avoid a close run-out chance. Bell had every chance to score only his second ODI ton, but he lost his way in that power play. Found it easier to score boundaries with the fielders back, bizarrely. Great diving catch by the man at midwicket by the way. Bell joins his county colleague in the 80s with a gentle single off Mooney. Interesting graphic on TV shows that Ireland have bowled too short or too full the whole innings, only one boundary scored by a right-hander from a ball classes as "good length". Let's hope one of the 2,000 analysts employed by the ECB points that out to James Anderson. Bell has faced most of this power-play and has hit only one boundary, he's getting frustrated. So am I. And now he's gone. The penultimate over of the powerplay is entrusted to Johnston. Fireworks time? Nope - Bell drives straight to cover, no run. Now he lofts over cover, single. Bell has batted patchily today. There should be sixes and fours, instead Trott defends to point, now he gets a single to long-off. Better from Bell, another Dilscoop for four. Young Dockrell has to bowl a lot in powerplays - he slips another one down the leg-side and to the boundary, this is getting messy from the Irish now. But apart from that filthy ball it's a very decent over. What will happen now with the (slightly) faster pace of Cusack to deal with? A wide down the leg-side beats O'Brien (standing up) and that's five to England's total. Bell drives straight to backward point, no run. We have our first boundary of the batting powerplay, Trott beating mid-on with a bunt down the ground, and now a really clean off-drive gets him four more as he goes to 80. From Rob, TMS inbox: "Trott and Pietersen might have equalled the great Viv Richards' record of getting to 1,000 runs in 21 matches, but I fancy that Sir Viv's 21 matches were not against the likes of Holland, Kenya and Ireland (with the greatest of respect to those rising cricketing nations)." The five-over period that dare not speak its name (for England batsmen) - it's the batting powerplay. Six fielders must stay inside the ring. England lose a wicket every 14.7 balls in batting powerplays, third worst behind Pakistan (12.6) and West Indies (14.2) of Test nations. (Thanks to Opta Sports for that). Dockrell is bowling, and not a single shot is played in anger but a couple of wides help the batting side's cause. Improvisation from Bell, it's the "Dilscoop" (TM Mahendra Mapagunaratne, 2009), the lofted sweep played fine off a seam bowler. Johnston's the perfect pace to attempt the shot off. Interestingly, its original purveyor - Tillakratne Dilshan - is a BBC website columnist for this tournament. From tonyprice1877: "Always remember being told you should double your score at 30 overs so England on for 350... I fear it may not be enough"
Trott takes a couple of runs off Dockrell to join Sir Viv Richards and Kevin Pietersen among the two batsmen to reach 1,000 ODI runs in only 21 innings. Amazing that two of those should be England players, quite frankly. Ooh - nice boundary from Ian Bell off Dockrell from a well-struck cover-drive. After that one over from Rankin, Porterfield is obviously not impressed and summons old man Johnston in his stead. Overall run rate dips below six an over again as England garner four singles from this one. Not sure the last drinks break I signalled was an official one, they're having a longer one now in any event. Fifteen overs to go, another 120 would be nice but my feeling is that Ireland will struggle to get anything approaching 300. I knew bits were starting to fall off my brain. Scotland have Hamilton (see below) and Dougie Brown who have done a mid-career England dalliance. Kepler Wessels may have played for a rebel South Africa before going to Australia for a bit and returning to SA, can't remember exactly. Stirling finishes off with 1-45 from his 10 - Bell hitting him over midwicket for two to go to his 50 and bring up the 100 partnership. TIme for the one bowler with a bit of pace in this Ireland team, Boyd Rankin, which means one Warwickshire bowler and two Warwickshire batsmen doing battle. Despairing dive from Wilson on the square-leg fence, Bell pulling efficiently for four. "Short, that, and it's powder-puff," says G Boycott - not convinced that Rankin has "trained on" in recent years. From Garry O'Reilly, TMS inbox, who was first with: "Didn’t Gavin Hamilton play for Scotland, then England picked him a couple of times which meant he had to wait five years before he finally returned to play for Scotland?" From BFInnoBystander: "World's Greatest Batsman (TM) knocks up another 50, yawns, scratches his guard again and beckons 'more' "
Stirling is into his ninth over, Trott and Bell push the score along. Now there's a widish yorker which is edged for four by Trott - but that was played on purpose, I believe. Almost a catch for Ed Joyce off a false shot from Bell out at widish long-on. Joyce is, I believe, the only cricketer to have played for one country, then had a go with another (England), only to return to his country of birth. Someone correct me if they can find another example. Trott gets two off Dockrell to move to 48. And there's his fifty, lofted sweep for four. He has a terrific ODI record has Jonathan Trott. With eight wickets in hand, we shouldn't be too critical of England, you know. The main idea is to ensure victory after all. Stirling has been the pick of the Ireland bowlers today and even when he drops short Bell can't capitalise. Reflections on KP's dismissal from Geoffrey Boycott: "He has plenty of talent but thinking is not his strength." From James in London: "Another idea for making the boring middle overs more interesting... How about the further you hit the ball for six the more runs it is worth... So if it clears the boundary it is still a six, if it goes in the crowd it is 12 runs... And if the batsman hits it out of the ground it is 18 runs? Would add a lot more excitement." Dockrell is into his sixth over, England need some boundaries really, and here comes Bell, very elegant footwork - and clipped gracefully over long-off for six. From David Smith, TMS inbox: "So KP manages to turn a right arm finger spinner into a left arm finger spinner by reverse sweeping. Anyone surprised he got out?" Dockrell is back into the attack and Pietersen is on the laptop on the England balcony. Twitter? E-mail to Jessica? Ebay? Hopefully, he's studying his silly shot which got him out. Quiet out in the middle. Trott down the wicket to Stirling, and here's a lofted on-drive for four. Interesting, mid-off could now go back to the fence but the field stays the same. Two dots ensue, before the man at backward point makes a fine stop off a square drive. Two singles end the over. Ah, the slumber is broken by an elegant lofted drive from Bell for a one-bounce four off Cusack, who has replaced Mooney. Andy Flower, shades on, looks on rather grimly. The England coach was the only member of the balcony not to be wreathed in smiles after that tie against India. He's a bit like Duncan Fletcher in his ability to control emotions. Allen Maslen, TMS inbox: "How about this to liven the middle overs up... Every time a boundary is hit, the bowler has to bowl the ball again, like he would in case of a no ball. This would make for potentially limitless scoring during the "boring" overs." Simon Hughes on TMS likes the look of Paul Stirling, who is on the books of Hughes's old county, Middlesex. He's a chunky little spinner in the Samit Patel mould. Three dots to Bell, who batted much more brightly than this against India. He gets his single before Trott misses an attempted reverse sweep. Excellent over, lots of under-spin, getting the ball to turn away from the right-handers if anything, rather than inwards like off-spinners are meant to. Trott moves to 34 with a single through point off Mooney. Bangalore is 1,000 metres above sea level, didn't you know? Well, I didn't. And we almost have a run-out as Trott was caught ball-watching while Bell came haring back for a second run. Throw went to the wrong end, otherwise that was curtains for Trott. Actually Niall O'Brien wasted time breaking the stumps at his end - should have just thrown it to the non-striker's end and he might have had his man. "Lots of talk about the powerplay being dangerous for the batsmen. When are captains going to make the leap as though to say: 'if that's what happens when you HAVE to bring in the fielders, why not bring in the fielders when it's not compulsory?' "
Much more of this gentle tapping about and England will have to settle for 280-odd. Or maybe not, streaky boundary from Trott, genuine outside edge past a vacant first slip for four off Stirling. Seven men inside the circle, bit of pressure being applied. Nice idea from Simon Mann, who says "any sixes hit between overs 20 and 40 should count as eight". That might liven up the middle overs, he feels. Vic Marks gently chuckles as Trott and Bell just keep the score ticking over, equally gently. On TMS, Simon Mann reckons England want 320-plus despite the recent success of the Irish spinners. Stirling is causing a few problems with balls sliding on with the arm and not spinning into the right-handers. He beats Trott with a nice ball and the run rate has been pegged back to six an over (which is still pretty good). From Mat, Cornwall: "I have a plan to counter England's powerplay problem, use a lower order batsman as a "powerplay watchman"?" Dockrell is surprisingly hoisted out after his first four overs cost only 17 and brought the wicket of Strauss. Does he need to be "saved"? Mooney it is instead, and there are just four men saving one for Bell who is one not out from seven balls. Inevitably, he finds a gap and picks a single. Trott hits a low full-toss through the covers and they run very hard for two. He's 23 from 24 balls, nice start. Porterfield makes a super stop from short midwicket to prevent one single, but the next ball Bell takes adavantage of a rather generous gap at mid-on to get off the mark. Commentators are not happy that Bell was allowed to get his innings going that way. "This is an interesting phase of the game with two new batsmen at the crease. From an Irish perspective if we can break this partnership, we have Collingwood coming in who isn’t in a bundle of form. The one thing this Irish team don’t lack is energy in the field. Both of these bowlers can keep the run rate down so Ireland can get back into this now." It was a really poor shot by Pietersen, who clearly felt the need to try something different. I refuse to accept he was simply "bored". Yet another unfulfilled innings from the great enigma that KP currently is. So it's the two Warwickshire men as Bell marches out to face Dockrell. The Irish spinners are doing very nicely at the moment. Spin at both ends. It's the off-spin bowler Paul Stirling, who appears not to have done a charity haircut/hairdye. Or maybe he has and it's just not as obvious. Stirling beats KP with a rather cunning arm-ball and that's OUT - caught off a reverse sweep by the wicketkeeper. Time for something refreshing... Interesting to see whether England keep on pushing or just sit back and push singles for a while with the field back. Let's try to avoid the awful "Sudoko overs syndrome" - a phrase coined, I believe, by former Reuters cricket writer Tony Lawrence. Trott is having a decent look at Dockrell before attempting a flick off his pads which is comfortably fielded by the man at short fine-leg. Finally, he picks an off-side gap for a single. Good over from George, as Kevin O'Brien comes back on to the field after getting some attention. From DamonDidcott: "You see, someone even MENTIONS the word 'powerplay' and England lose a wicket. It's a hex!" Two lovely boundaries from the new man Trott off Mooney: a square-drive followed by a late cut, and now Pietersen hits a short one off the front foot high over midwicket for six. That ends the bowling powerplay, so Ireland can send a couple more people scurrying to the boundaries. Relief. "He tried to be too clever there. He made that fantastic 150 the other day but he was cheeky and a little careless today. Maybe it’s not such a bad thing for England because it gives someone else a chance to spend time in the middle. England want their best players to peak in time for the quarter-finals." A long conference between Porterfield, Johnston and Dockrell as Jonathan Trott prepares to face his first ball. More replays of the Strauss shot, he seemed a bit hurried and did not get into position to play a sweep or a pull - but give the bowler lots of credit, perhaps got some overspin or "dip" on the delivery to fool a very good batsman in top form. The 18-year-old strikes. Careless shot from Strauss, trying to pull or sweep something that wasn't really there for the shot, and he just gets a bottom edge off Dockrell onto the stumps. Now, can Ireland build on that breakthrough? From bossbeechyscoop: "Eng should take batting powerplay early if these 2 still together: and if one gets out, send Broad in." I know this chap, he's at the ground. Any colour you can provide from the Chinnaswamy stadium, Beechy? It's another change for Ireland, with the 29-year-old John Mooney's medium pacers getting an airing. The men in green desperately need a wicket, but Strauss won't gift them anything here, dabbing down to third man for one. Pietersen moves to 53 with a very sharp single to point. A huge lbw appeal but that can't possibly be out, would have missed leg stump by a foot. Decent start from Mooney. "Kevin says he has no problem with left-arm spinners. All I can say is that if a particular type of bowler kept getting me out I have a serious problem. Mind you, Kevin will be much happier facing Dockrell with 40-odd runs on the board." It's time for the 18-year-old wunderkind of the Irish set-up, George Dockrell. He's a left-arm spinner you know, and Pietersen has had a few problems dealing with them in the past. Not much turn for the youngster, but he's located a nice length. This is the second over of the bowling powerplay by the way, so only three men are allowed on the boundary and Pietersen comes down the track to hit his 40th ball wide of mid-on for four and go to 51 not out. From James Pope, TMS inbox: "This game has major significance for my flatmate today, as it is the first strain on his mixed nationality relationship. A proud Englishman he is dating an Irish woman and as this game is before the 6 Nations clash, the pressure begins today! Whoever wins, they lose (and me, I live with him!)" From Baron_Flumpy: "I give it another few overs before Pietersen does something stupid and gets himself out." Strauss comes skipping down the track like a gambolling lamb in spring, but gets nothing on a Cusack delivery outside off stump. He's being outscored by Pietersen now, and the right-hander has looked more solid too. Cusack presents one in Pietersen's arc right on his pads and it's launched for four. That was asking to be smashed away. Pietersen, who has scored more than half his runs in this tournament through mid-off and mid-on - someone's been listening to Goochie I think - launches Johnston high and handsomely over mid-on for his first six of the day. A low full toss gets England and KP two more, but Strauss has to hurry to get back in time. Good over for England. Alex Cusack, a medium-pacer, comes into the attack and sees Strauss deflect his first ball through the vacant slips for four. Pietersen bangs a cover-drive into the turf, and that bounces over the fielder close in and has enough oomph and timing on it to reach the boundary too. No excuses for England if they fail to get well over 300 today. But Strauss is almost caught at short midwicket, pulled out of a forcing shot and it ballooned off the bat, but didn't reach the fielder. From Chris, Hampshire: "Could George Dockrell as he improves turn over to the England squad like Eoin Morgan?" Indeed he could, and he gave an interview earlier this week suggesting he might, in time, do exactly that. No change in the bowling yet, Johnston - one of the heroes in that win against Pakistan four years ago - keeps plugging away. Singles here as the team 50 comes up, but a better over for Ireland. From thefuggler: "To be fair, a robust forward defensive goes for four at Greys Green..."
From David Wignall, TMS inbox: "Could this match also be seen as a recruitment opportunity for England? Is it considered bad form to steal the other team's best players during a tournament? Or a match?" With Botha not in the team today, all-rounder O'Brien would be needed to do some bowling, and after a quick spray of something from the physio he gets back to his feet, briefly removing his cap to show off some pink hair-dye. Good news. Rankin completes the over. Runs keep coming, Strauss moving to 19 with a couple of runs flicked off his pads. Rankin pitches one up, but Strauss can't pick an offside gap. Lots and lots of empty spaces in this big stadium, which is a big shame. First extra of the day is a Rankin wide. Kevin O'Brien fielding at wide mid-off has collapsed in fielding the ball and has picked up some sort of injury. Each batsman takes a single with Niall O'Brien (wearing a helmet and shades) coming up to the stumps for Johnston's bowling. The closer attentions of the wicketkeeper seem to work as England's pair are kept quiet for a while - until a ball on leg-stump is disdainfully flicked away for four by Pietersen. "There’s no justice that Rankin went for six there. It was a good bouncer and Strauss was not in control of the shot. A let-off for the England captain. Rankin is a big man, he’s got a bit of bounce and he deserved a wicket there." From Andrew, Belfast: "Quite depressing that eight years ago I was playing schools cricket against Rankin and Porterfield. Think I could have taken KP with my leggies but Bell and the rest would liked the look of them." Finally, Rankin does try a short one, and it works - Strauss swaying out of the way to show the bowler a bit of respect. Perhaps expecting another awkward one, Strauss plays a rather ugly attempted drive next up. Big top-edge from a Strauss pull now, and he is lucky! It just disappears over Dockrell at fine-leg for a six. Luck of the English. From iamthewrongun: "Big Boyd looks like the monk out of the Da Vinci Code with his new hair, hope he doesn't flagellate when he bowls a wide." Strauss moves to 10 as he slashes Johnston over a vacant fourth slip area (approximately) for four. How long will it be before the exciting young spinner George Dockrell gets a go? From AltCricket: "Strauss in ODIs over the last year: 24 innings, 1,235 runs, average 53.69, strike rate 95.58, 3 hundreds and 9 fifties. That's the most runs of any captain and and the most runs of any opener. Yeah, more than Amla, Sachin, Dilshan, etc, etc..."
Thick inside edge from Pietersen as he squirts through square-leg for four. Memories of one of my lucky boundaries for Turville Park at Greys Green last September. Next one is very much KP and not Oliver Brett, a cleanly cracked straight drive for four more as Pietersen rushes to 15. Rankin should try some shorter stuff really, just to see what happens. Two from Strauss to finish a fine over for England, the Irish fielding's a bit ropey by the way, betraying some nerves. Johnston (clean-shaved) strays onto the Strauss pads and there's plenty of space for England to canter a couple. Nest one's tempting, full and outside off, but the England skipper turns down that tempting little cream cake and instead mistimes a shorter ball, with KP urging him through for a single. KP's legs are so wide as he bats he could be astride a huge horse. From Vaclav Marsalek, Prague, TMS Inbox: "As maybe the only fan of cricket in the Czech Republic, I wish Strauss to score a century on his birthday today. The game on Sunday was magnificent. Just a shame this sport is being played by so few countries." Rankin's charity barnet of choice is a bleached, spiky gelled thing. Anyway, Strauss gets a single and Pietersen comes right across his stumps to collect two with a purposeful leg-glance. Now he times one from outside off-stump through an on-side gap and that's an effortless boundary. Could be runs galore today. From Surreygirlsoph: "Ravi should be playing. I don't understand why Colly is there and he isn't? Really James Foster is the best wicketkeeper too!" Are you sure you aren't an Essex girl in disguise? Here's Strauss and Pietersen, who once had a brilliantly horribly hairdo of his own (a sort of dead blue skunk, in 2005) and the first ball will be bowled by Boyd Rankin. When he gets it right he's a pretty fast and testing bowler. From Anonymous: "Botha's dibbly dobblies will be missed but Wilson, who is usually a keeper, is breaking through for Surrey so should provide good batting depth. Cusack is in for White btw which means there are only the two spinners in the line-up." Thanks for that, and apologies for missing the second Irish alteration from the team beaten by Bangladesh in their first match of the tournament. "England have only played Ireland three times, but they have never been pushovers. Ireland have a statement to make; I think they will fancy themselves to be the strongest of the associates and this is a chance for them to show that." From Steve, Antwerp, TMS Inbox: "It has to be said ... let's hope Ireland hit a purple patch ... but only take England to the wire (and no further!)" I am still not entirely happy about an England middle order without Ravi Bopara in it, but Ian Bell proved his credentials on Sunday and we have to have two spinners, so this is the right team for England in my opinion. Now it's time to explain the Porterfield hairdo. If you don't already know, players and coaching staff from the Ireland cricket team have been busy in a Bangalore hair salon to raise awareness for the Irish Cancer Society. Strauss, whose birthday it is today - he's 34, is briefly asked to reflect on the tie against India: "It's ignited the World Cup, not just for us, but for the tournament as a whole." Ireland captain William Porterfield, wearing shocking purple hair, reckons he's happy enough chasing as long as they can restrict England to a total that isn't too huge. "We're pretty confident, we're ready to go." England win the toss and bat. Confirmation that Andrew Strauss has called correctly and will bat first on the ground where he hit that brilliant century on Sunday. Bright blue skies, more big runs on the way for him and England? Broad does play, replacing Ajmal Shahzad. On Twitter: "Not quite so many in today at the Chinnaswamy..."
Say what you like about the last two World Cups - and some fairly unkind things have been said about them - but we did have one or two delicious moments when the minnows swallowed up the big sharks. Could it happen today when England take on Ireland in Bangalore? Well, could it?